The Royal Thai Air Force or RTAF (Thai: กองทัพอากาศไทย; RTGS: Kong Thap Akat Thai) is the air force of the Kingdom of Thailand. Since its establishment in 1913 as one of the earliest air forces of Asia, the Royal Thai Air Force has engaged in numerous major and minor conflicts. During the Vietnam War era, the RTAF was supplied with USAF-aid equipment. In February 1911 Belgian pilot Charles Van Den Born was responsible for the first aircraft demonstration in Siam at Bangkok's Sapathum Horse Racing Course. King Rama VI was sufficiently impressed that on 28 February 1912 he sent three Army officers to France to learn to fly. After receiving their wings and qualification, the officers returned to Siam in November 1913, bringing with them eight aircraft: four Breguets and four Nieuport IVs). In March 1914, Thai aviation moved from Sapathum to Don Muang then north of Bangkok. The Ministry of Defence placed the Siamese Flying Corps under the Army Engineer Inspector General Department. Prince Purachatra Jayakara, Commander of the Army Engineers, and his brother Prince Chakrabongse Bhuvanath, were instrumental in the development of the Royal Siamese Aeronautical Service as it was renamed in 1919. In 1937, it became an independent service known as the Royal Siamese Air Force. Two years later, when the kingdom's name was changed to Thailand, it became the Royal Thai Air Force. The Air Force during the years before the Second World War was seen as a moderately-well equipped force with relatively modern aircraft; a mixture of several French, American, and Japanese types. During the French-Thai War, the Thai Air Force achieved several air-to-air-victories in dogfights against the Vichy Armée de l'Air. During World War II, the Thai Air Force supported the Royal Thai Army in its occupation of the Shan States of Burma as somewhat reluctant allies of the Japanese and took part in the defense of Bangkok against allied air raids in the latter part of the war, achieving some successes against state-of-the-art aircraft like the P-51 Mustang and the B-29 Superfortress. During these times, the RTAF was actively supplied by the Japanese with Imperial Japanese Army Air Force aircraft such as the Ki-43 "Oscar," and the Ki-27 "Nate." Other RTAF personnel took an active part the anti-Japanese resistance movement. The Thai Air Force sent three C-47s to support the United Nations in Korean War. The Wings Unit, operating the C-47, also joined the anti-communist forces in the Vietnam War. Along the border, the Thai Air Force launched many operations against communist forces, including the Ban Nam Ta Airfield Raid in Laos, and clashes between Thai and communist Vietnamese troops along the Thai-Cambodian border. When the Cold War ended, the Thai Air Force participated in Operation Border Post 9631 along the Thai-Burmese border in 1999, and launched the evacuation of foreigners during the 2003 Phnom Penh riots in Cambodia. For fiscal year 2018 (FY2018) the air force's budget is 39,931 million baht. The Royal Thai Air Force is commanded by the Commander of the Royal Thai Air Force (ผู้บัญชาการทหารอากาศไทย). The Royal Thai Air Force Headquarters is located in Don Muang Airbase, Bangkok, Thailand. The RTAF command structure consists of five groups: headquarters, logistics support, education, special services, and combat forces. The headquarters group in Bangkok performs the usual general staff functions, including planning and directing operations of the combat elements. The support group provides engineering, communications, ordnance, transportation, quartermaster, and medical services support. The education group coordinates and supervises all air force training programmes. The special service group is responsible for the welfare of air force personnel and coordinates the activities of Thai civil aviation with those of the air force. The Royal Thai Air Force maintains a number of modern bases which were constructed between 1954 and 1968, have permanent buildings and ground support equipment. 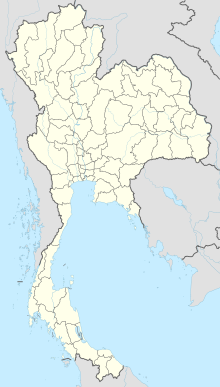 All but one were built and used by United States forces until their withdrawal from Thailand in 1976 when Thai air force assumed use of the installations at Takhli and Nakhon Ratchasima (Korat). In the late 1980s, these bases and Don Muang Air Base outside Bangkok, which the air force shares with civil aviation, remain the primary operational installations. Maintenance of base facilities abandoned by the United States proved costly and exceeded Thai needs. Nonetheless, all runways were still available for training and emergency use. By 2004 the Royal Thai Air Force had its main base at Don Muang airport, adjacent to Don Mueang International Airport. The RTAF also had large air fields and facilities at Nakon Ratchasima Ubon Ratchathani, and Takhli. The following squadrons are currently active with the Royal Thai Air Force. 203 Helicopter Sqn UH-1H Wing 2 Khok Ka Thiem SAR detachments at many locations. 461 Transport Sqn Basler BT-67 Wing 46 Phitsanulok Also conducts rainmaking flights. 561 Fighter Sqns - Wing 56 Hat Yai Forward operating base for 701 Fighter Sqn. 904 Aggressor Sqn F-5E - Don Muang Former unit of Crown Prince Vajiralongkorn Mahidol. 1st Flying Training Sqn PAC CT/4E Flying Training School Kamphang Saen Primary flight training. 2nd Flying Training Sqn Pilatus PC-9M Flying Training School Kamphang Saen Basic flight training. 3rd Flying Training Sqn Bell 206B (withdrawn 2006) Flying Training School Kamphang Saen Helicopter training. This 100 man unit, part of the Royal Thai Air Force's Special Combat Operations Squadron, was formed in the late 1970s and are based near Don Muang Airport and provide anti-hijacking capabilities. They have three assault platoons, each divided into two sections. The Royal Thai Air Force Combat Group is divided into 11 wings plus a training school, plus a few direct-reporting units. Interceptor and fighter wing based at RTAFB Korat in Nakhon Ratchasima Province. Light attack / Interceptor wing based at RTAFB Takhli in Nakhon Sawan Province. SAAB 340/AEW of the Royal Thai Air Force. Transport and special mission wing based at RTAFB Prachuap Khiri Khan in Ao Manao, Prachuap Khiri Khan Province. Multi-role non-combat wing providing transport, mapping, communications and surveying. Based at RTAFB Don Muang/Bangkok. Interceptor and fighter wing based at RTAFB Surat Thani in Surat Thani Province. The wing is nicknamed, "Ferocious Shark of the Andaman" as well as "House of Gripen" as they fly Gripen aircraft. Interceptor wing based at RTAFB Ubon Ratchathani in Ubon Ratchathani Province. Attack wing based at RTAFB Udon in Udon Thani Province. Light attack wing based at RTAFB Chiang Mai in Chiang Mai Province. Transport/rainmaking wing based at RTAFB Phitsanulok in Phitsanulok Province. Frontal operating base at RTAFB Hat Yai in Songkhla Province. First set up in 1913 in the same year as the Air Force, providing nursing services only, and over the years has gradually expanded. It operates Bhumibol Adulyadej Hospital and Royal Thai Air Force Hospital in Bangkok, as well as smaller hospitals at each wing. The directorate has made a teaching agreement with the Faculty of Medicine, Chulalongkorn University to train students at Bhumibol Adulyadej Hospital, accepting about 30 students per academic year. 1Rank on paper, not actually used in the Royal Thai Air Force. ^ "THAILAND'S BUDGET IN BRIEF FISCAL YEAR 2018". Bureau of the Budget (Thailand) (Revised ed.). p. 84. Archived from the original on 7 August 2018. Retrieved 6 September 2018. ^ "Thailand Orders Eurocopters EC725 for SAR Missions". Archived from the original on 4 July 2017. Retrieved 29 January 2018. ^ "KAI will export T-50s to Thailand". 17 September 2015. Archived from the original on 19 September 2015. Retrieved 29 January 2018. ^ "THAI GRIPEN: GUARDIANS OF THE SKIES". 31 October 2015. Archived from the original on 3 March 2016. ^ Reed Business Information Limited. "SINGAPORE: Saab looks for additional Thai Gripen sale". Archived from the original on 22 February 2014. Retrieved 24 December 2014. ^ Nanuam, Wassana (2016-02-11). "Air force readies to go digital". Bangkok Post. Retrieved 11 February 2016. ^ a b c d e f g h i j k l m n o p q r s t u "World Air Forces 2018". Flightglobal Insight. 2018. Archived from the original on 2 December 2017. Retrieved 12 December 2017. ^ "Royal Thai Air Force B737". airfleets.net. Archived from the original on 19 June 2015. Retrieved 20 June 2015. ^ "A319 for VIPs". flightglobal.com. Archived from the original on 2 July 2015. Retrieved 20 June 2015. ^ "Sukhoi Civil Aircraft to Deliver the Third SBJ to the Royal Thai Air Force". Superjet International. Archived from the original on 6 October 2018. Retrieved 6 October 2018. ^ Parameswaran, Prashanth (23 June 2018). "Sukhoi Superjet Delivery Spotlights Russia-Thailand Military Cooperation". The Diplomat. Archived from the original on 6 October 2018. Retrieved 6 October 2018. ^ "Thai military gets new S-92, Mi-17 helicopters". flightglobal.com. Archived from the original on 2 July 2015. Retrieved 20 June 2015. ^ Dominguez, Gabriel (24 October 2018). "RTAF receives two more H225M helos". www.janes.com. IHS Jane's. Archived from the original on 24 October 2018. Retrieved 25 October 2018. ^ a b c d e Trade Registers Archived 14 April 2010 at the Wayback Machine. Armstrade.sipri.org. Retrieved on 2015-05-18. Wikimedia Commons has media related to Royal Thai Air Force.